Outgoing Company Commander Melissa Bonner pins the rank device on incoming Company Commander Trea Renwick. CDR John Sachleben, Senior Naval Science Instructor, Highland High School, presents a National Leadership Award to cadet Heather Ross on behalf of The Military Order of the Purple Heart. SPARTA — On Thursday, May 3, Highland High School’s NJROTC unit once again passed down the reigns of cadet leadership to the incoming Naval Science Four cadets. The Change of Command ceremony occurs at the end of every school year, when the current Naval Science Four cadets pass down their positions to the incoming Naval Science Four cadets of next year. Cadet Company Commander Melissa Bonner passed down her position to Cadet Trea Renwick, who will be Company Commander of the Highland NJROTC unit for school year 2018-2019. The change in leadership is not the only thing that occurs during this ceremony. Various cadets within the unit were personally recognized for their actions in upholding the Navy core values of Honor, Courage and Commitment. Numerous cadets were recognized by outside organizations for their leadership and commitment to citizenship. As an example, Cadet Heather Ross, a first-year cadet, received a national leadership award from The Military Order of the Purple Heart presented by CDR John Sachleben. The ceremony on Thursday achieved a very healthy attendance from the student body and parents of cadets within the unit. Everyone watched as the Naval Science Three cadets were promoted to their positions that they will hold next year. Many of the cadets within the unit were also promoted to the next higher rank after they passed their advancement exam. Highland High School remains a strong supporter of the NJROTC unit. With the help of Highland High School, the NJROTC unit has a lot of support from the public and the community surrounding the school district. The incoming Naval Science Four cadets expressed how excited they were for the opportunity to lead the unit. 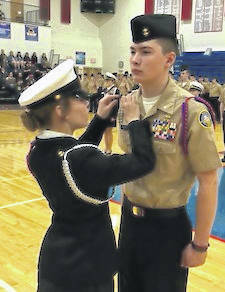 https://www.morrowcountysentinel.com/wp-content/uploads/sites/29/2018/05/web1_Bonner-Renwick.jpgOutgoing Company Commander Melissa Bonner pins the rank device on incoming Company Commander Trea Renwick. 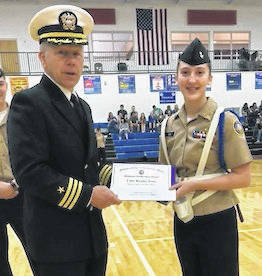 https://www.morrowcountysentinel.com/wp-content/uploads/sites/29/2018/05/web1_MOPH.jpgCDR John Sachleben, Senior Naval Science Instructor, Highland High School, presents a National Leadership Award to cadet Heather Ross on behalf of The Military Order of the Purple Heart.